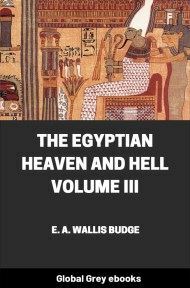 Chapters include: The Belief In God Almighty; Osiris The God Of The Resurrection; The "Gods" Of The Egyptians; The Judgment Of The Dead; and, The Resurrection And Immortality. 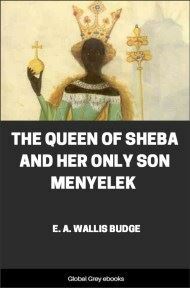 A STUDY of ancient Egyptian religious texts will convince the reader that the Egyptians believed in One God, who was self-existent, immortal, invisible, eternal, omniscient, almighty, and inscrutable; the maker of the heavens, earth, and underworld; the creator of the sky and the sea, men and women, animals and birds, fish and creeping-things, trees and plants, and the incorporeal beings who were the messengers that fulfilled his wish and word, It is necessary to place this definition of the first part of the belief of the Egyptian at the beginning of the first chapter of this brief account of the principal religious ideas which he held, for the whole of his theology and religion was based upon it; and it is also necessary to add that, however far back we follow his literature, we never seem to approach a time when he was without this remarkable belief. It is true that he also developed polytheistic ideas and beliefs, and that he cultivated them at certain periods of his history with diligence, and to such a degree that the nations around, and even the stranger in his country, were misled by his actions, and described him as a polytheistic idolater. But notwithstanding all such departures from observances, the keeping of which befitted those who believed in God and his unity, this sublime idea was never lost sight of; on the contrary, it is reproduced in the religious literature of all periods. Whence came this remarkable characteristic of the Egyptian religion no man can say, and there is no evidence whatsoever to guide us in formulating the theory that it was brought into Egypt by immigrants from the East, as some have said, or that it was a natural product of the indigenous peoples who formed the population of the valley of the Nile some ten thousand years ago, according to the opinion of others. All that is known is that it existed there at a period so remote that it is useless to attempt to measure by years the interval of time which has elapsed since it grew up and established itself in the minds of men, and that it is exceedingly doubtful if we shall ever have any very definite knowledge on this interesting point. But though we know nothing about the period of the origin in Egypt of the belief in the existence of an almighty God who was One, the inscriptions show us that this Being was called by a name which was something like Neter, the picture sign for which was an axe-head, made probably of stone, let into a long wooden handle. The coloured picture character shews that the axe-head was fastened into the handle by thongs of leather or string, and judging by the general look of the object it must have been a formidable weapon in strong, skilled hands. A theory has recently been put forward to the effect that the picture character represents a stick with a bit of coloured rag tied to the top, but it will hardly commend itself to any archaeologist. The lines which cross the side of the axe-head represent string or strips of leather, and indicate that it was made of stone which, being brittle, was liable to crack; the picture characters which delineate the object in the latter dynasties shew that metal took the place of the stone axe-head, and being tough the new substance needed no support. The mightiest man in the prehistoric days was he who had the best weapon, and knew how to wield it with the greatest effect; when the prehistoric hero of many fights and victories passed to his rest, his own or a similar weapon was buried with him to enable him to wage war successfully in the next world. The mightiest man had the largest axe, and the axe thus became the symbol of the mightiest man. As he, by reason of the oft-told narrative of his doughty deeds at the prehistoric camp fire at eventide, in course of time passed from the rank of a hero to that of a god, the axe likewise passed from being the symbol of a hero to that of a god. Far away back in the early dawn of civilization in Egypt, the object which I identify as an axe may have had some other signification, but if it had, it was lost long before the period of the rule of the dynasties in that country. 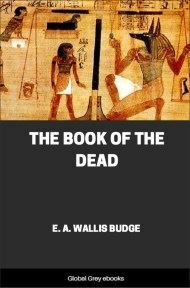 Passing now to the consideration of the meaning of the name for God, neter, we find that great diversity of opinion exists among Egyptologists on the subject. 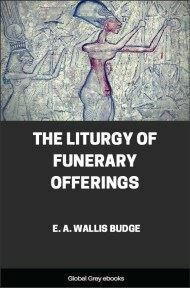 Some, taking the view that the equivalent of the word exists in Coptic, under the form of Nuti, and because Coptic is an ancient Egyptian dialect, have sought to deduce its meaning by seeking in that language for the root from which the word may be derived. 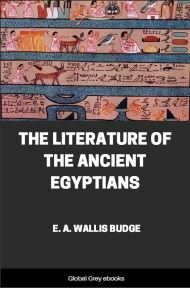 But all such attempts have had no good result, because the word Nuti stands by itself, and instead of being derived from a Coptic root is itself the equivalent of the Egyptian neter, and was taken over by the translators of the Holy Scriptures from that language to express the words "God" and "Lord." 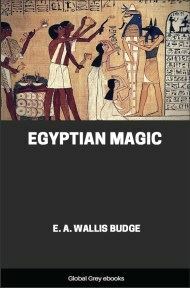 The Coptic root nomti cannot in any way be connected with nuti, and the attempt to prove that the two are related was only made with the view of helping to explain the fundamentals of the Egyptian religion by means of Sanskrit and other Aryan analogies. It is quite possible that the word neter means "strength," "power," and the like, but these are only some of its derived meanings, and we have to look in the hieroglyphic inscriptions for help in order to determine its most probable meaning. 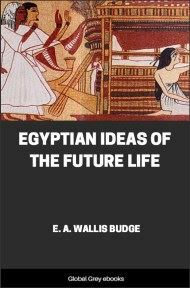 The eminent French Egyptologist, E. de Rougé, connected the name of God, neter, with the other word neter, "renewal" or "renovation," and it would, according to his view, seem as if the fundamental idea of God was that of the Being who had the power to renew himself perpetually--or in other words, "self-existence." The late Dr. H. Brugsch partly accepted this view, for he defined neter as being "the active power which produces and creates things in regular recurrence; which bestows new life upon them, and gives back to them their youthful vigour."